Welcome to the latest issue of the Relationships Newsletter. We hope you enjoy the Quote of the Month, Finkel’s Five, and Thibaut’s Tidbits. It’s been a fun year for the Relationships Newsletter. I’ll be taking a hiatus as I work on a proposal for my second book, which explores whether the wisdom of relationship science can ameliorate the toxic partisanship of our current political climate. More soon…. 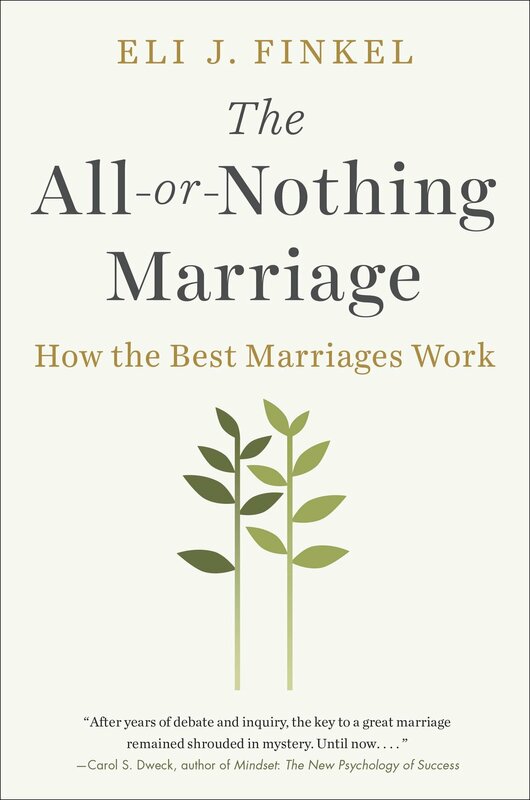 Are you interested in how marriage has changed over time, why those changes have made some marriages better and others worse, and how we can improve our own marriage? Check out my bestselling book. "You’ll never know anyone’s marriage but your own. And even then, you’ll only know half of it." 2. On a less amusing note, it looks like the rise in political polarization is converging with the growing gender divide between Democrats and Republicans to create significant marital strife in America. In an article titled “Donald Trump Is Destroying My Marriage,” Molly Langmuir offers a succinct summary of the situation: “By now it’s a truism to point out that the election of Donald Trump and the #MeToo movement have prompted a wholesale realignment of American politics. But it’s also sent shock waves through heterosexual romance.” The article provides a handful of first-person accounts of the challenges of love and relationships in a toxic political climate. 4. The idea that an individual might “need space” in a relationship strikes me as a self-evident truth. But, as with many self-evident truths, this one is entirely dependent on the cultural and historical context. In a new Atlantic article, Julie Beck discusses how and why this idea—that people need space in a relationship—emerged in the 1970s. With the rising influence of the self-expressive marriage—a model in which spouses look to each other not only for love, but also to help them growth as individuals and live more authentic lives—people increasingly lived in accord with Fritz Perls’s “Gestalt Prayer” (1969): “I do my thing and you do your thing. / I am not in this world to live up to your expectations, / And you are not in this world to live up to mine. / You are you, and I am I, / and if by chance we find each other, it’s beautiful. / If not, it can’t be helped.” This idea was a radical departure from all mainstream views from earlier eras, but it has become dominant. Keeping this context in mind can help us navigate challenges, and leverage opportunities, without our own romantic relationships. 5. As I sign off from “Finkel’s Five” for my book-proposal hiatus, I leave you with a love story for the ages. Writing in the Washington Post, Rachel Siegel reports on the 73-year marriage that developed after Barbara Pierce, 16, met the recently deceased George H. W. Bush, 17. There are many ways to build a happy romantic life: Both of my parents have been happily remarried for several decades, and I didn’t marry until was 33. And marriage certainly isn’t necessary to live a good life. But still, there’s something beautiful about those special cases in which teenage lovebirds grow into nonagenarian lovebirds. All is well in the RAMLAB this month. I’m worried I’ll get a bit bored during the newsletter hiatus, so I just joined SheepBumble. Wish me luck!